Treat that special someone this Valentines Day and get a 25% saving on selected Jewellery. Diamonds and Pearls last a lifetime, treat yourself to more in this amazing outlet sale. Why pay full price when you can find a gorgeous selection of Earrings, Necklaces, Rings and much more for a fraction of the original price - go on treat yourself or a loved one today for less! Add some extra sparkle today with a bargain buy from Hot Diamonds. Indulge in a diamond treat with a purchase of a sterling silver or rose gold plated ring with a dazzling diamond. Add it to your jewellery collection for a touch of elegance. Whether this is a well deserved treat for yourself or a gift for someone special you will not be disappointed! Discover an array of stunning charms including good luck charms, birthday charms, eternity charms and much more. All the charms available make the perfect gifts, great to commemorate a special occasion or to add to someone's stylish charm bracelet. Recieve a free Anais Charm when you buy any Anais Locket and chain. Where do I use my Hot Diamonds voucher code? Copy the code of your choice on the NetVoucherCodes.co.uk website before clicking through to hotdiamonds.co.uk. Browse Hot Diamonds for your jewellery and when you’re ready, click ‘add to bag’. You will now be taken to your shopping bag, you can enter your discount code on the right just under your order summary, enter your code and click the arrow to apply your discount to your order. Click ‘checkout’ to proceed with your order and fill in your personal info and payment details. "Hot Diamonds runs stackable codes several times a year (usually an extra 30% off, occasionally up to 40% on top of it's 50% sale prices)." 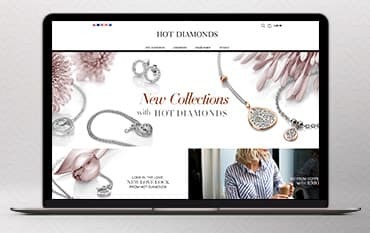 From its initial launch in 2001 Hot Diamonds became an overnight success story and has since won the UK Jewellery Awards twice, with a further 5 times being in the finals. 2008 saw the launch of hotdiamonds.co.uk which encompasses the style and craftsmanship of Hot Diamonds with sterling silver and diamond pieces. This UK jewellery brand is now an international leader in contemporary designs, which are ageless and timeless. Each piece has its own signature diamond within the design, making them the ideal choice for a special gift for a loved one or a self-treat. With a useful buying guide, giving you information on the different types of metal, from Silver, Gold and White Gold to Rhodium Plated and a handy guide for ring sizes then choosing the right gift is easy. Categories are split into necklaces, bracelets, earrings, rings, charms and their own unique collections. Purchases are packaged in simple yet classically elegant boxes/bags, ensuring that the item is safe and ready to be given to the lucky recipient. Explore the iconic range of luxurious necklaces today at Hot Diamonds! Featuring a classic sterling silver and rose gold plated styles. Whether you're in search for a timeless piece which will last a lifetime or a more contemporary look, with the necklace collection at Hot Diamonds, you are sure to find something which will cater for any occasion. Each and every item has been carefully designed, down to the very last detail making every piece unique and sentimental. Start browsing the stunning collection today. Explore the abundance of stunning Bracelets & Bangles today at Hot Diamonds which are sure to add a contemporary statement to your look. Each piece is designed with a unique twist on modern jewellery featuring precious and semi-precious metals and stones which lend themselves as the perfect gift for someone special. Whatever the occasion, there is luxurious bracelet designed with you in mind! The Diamond Earring collection at Hot Diamonds is delicately crafted in sterling silver and often accentuated with gold plating for that added touch of elegance. Every piece is adorned with a gorgeous real one point diamond featuring an array of stunning styles including drop, stud, and diamond hoops. Explore the beautiful collections for all occasions today. You can return unwanted products free of charge within 28 days of delivery, for a refund or replacement. Hot diamonds craft and sell beautiful Jewellery pieces with each piece having its own signature diamond within the design. Over the years their collections have grown and their extensive range now includes; the Emozioni Collection, Stargazer, Make a Wish, Just add love and Memoirs, amongst many others. Better still, you can save money on jewellery by using one of our Hot Diamonds voucher codes. Many collections consist of mainly Sterling Silver pieces, but across the site you will find beautiful items available in Gold and Rose Gold too.